At the broadest view, a brand is the way others perceive you. Brand experience is made up of a lot of building blocks. It includes everything from design basics like website design, colors, typography and logo design, to the way a customer consumes and interacts with your brand (like social media posts or email newsletters). Think of it as an all encompassing umbrella to everything you do, say, share, and, my favorite, what you look like. Overwhelmed much? Let’s break it down. When people look at your brand, the first thing they see is your font. After all, they are reading your store front sign or business card, aren’t they? It’s important to choose the right font for your brand because typography is the very first impression that sets up your whole brand experience. When I’m window shopping I can almost always tell what stores I can and can’t afford (yes, a sad truth), and my first tip-off is the font choice. For example, handwritten fonts feel more inviting and relaxed while serif fonts feel more elite and classy. See where I’m coming from? Think of Kate Spade vs. H&M. And hey, if you’re not familiar with different kinds of fonts, click here to check out my detailed post where I break down categories of fonts and what they mean. We’re all familiar with mood as a human characteristic, but what about a font characteristic? To define the mood of a font, ask yourself what the font feels like. It may be hard at first to describe, but with a little practice you’ll be able to better grasp the mood you’re giving off to your customers just by your font choice. Fonts can feel mello and relaxed or intense and action-packed, warm and inviting or cold and distant. The mood of your font can be as simple as modern or traditional, happy or sad. Think of moods as everything the type evokes. A script font might be too gentle for your brand, or a serif might be too formal. Think about how you want your customer to feel when they interact with your brand, do those same moods/feelings fit with your font choice? Choosing the right font is largely part of the font’s mood. Font combinations can create a more complex mood, so make sure you analyze each of the fonts in your brand and see how well their moods mix together. Do they compliment each other? Or are they redundant and overbearing? This first font is Madfont (download free font here). It has wide-set letters that are strong and brawny. But once you combine those features with lovely scalloped edges, this turns out to be a strong feminine font. The second font is Barkentina (download free font here). It’s dainty, light and gently feminine. It’s not screaming in your face with curly cute nonsense. It feels mature and poised. While mood is what the font feels like, tone is the general character or attitude of the font. When knowing how to find the right font, think of qualities and attitudes your brand’s font possesses, instead of how it feels. Is it macho and outgoing or soft spoken and passive, loud and stuck-up or relatable and down-to-earth? If you think of tone as the general character of your font, ask yourself whether the font is male or female, young or old. Do your answers to these questions describe your ideal audience? If so, you’re on the right track. If not, it’s time to make a few adjustments. This first font is Amperzand font (download free font here). Its character feels like old timey royalty. It’s a classy, fancy script with decorative flair (especially in that reaching uppercase “S”). The second font is Airship 27 font (download free font here). It’s character feels masculine with its rigid edges and overall blocky shape. Its very strict and stern. I know what you’re thinking, how could personality possibly be different that mood and tone? Sorry, it is. But don’t worry! Once you’re able to determine the mood and tone of your font, finding the personality comes easy. I wrote a whole blog post on finding the right font to back up your brand personality (click here) — it’s essential is knowing how to choose the right font for your brand and everything your brand personality evokes. Make sure you read that post before moving on —it’s a more in depth post with examples to guide you into really understanding the personality of a font. The best way for me to discover the personality of a font is to personify it. Give the font human characteristics, and start to describe the font as if it were a person. It may feel silly at first, but it’s the best way to get to know a font. Once you define who the font is, it becomes easier to find out where this font would live and belong. Now that we have the tone and mood set, ask more detailed questions about who this font is. What would the font do in it’s free time? Where would you find the font shopping? What would the fonts home life look like? Alright, let’s get practical. Scalability means you need to be thinking about where this font is going to live. Will it be large, small, watermarked or stamped? Some fonts and logos live in small places like on small clothing tags or on the back of greeting cards. Is the font still readable or do parts of your logo get lost and muddy? On the other hand, if the font is really big, is the negative space awkward or distracting? It’s important to think about where your font will live, so you can choose the right font that will compliment the space it inhabits. The first font is Nouvelle Vague Black (download free font here), the letters get jumbled and start to become illegible at a smaller scale. Meanwhile, the second font, Sticky things (download free font here) becomes oversize and pixelated, losing it’s inhert authenticity as a brush font. 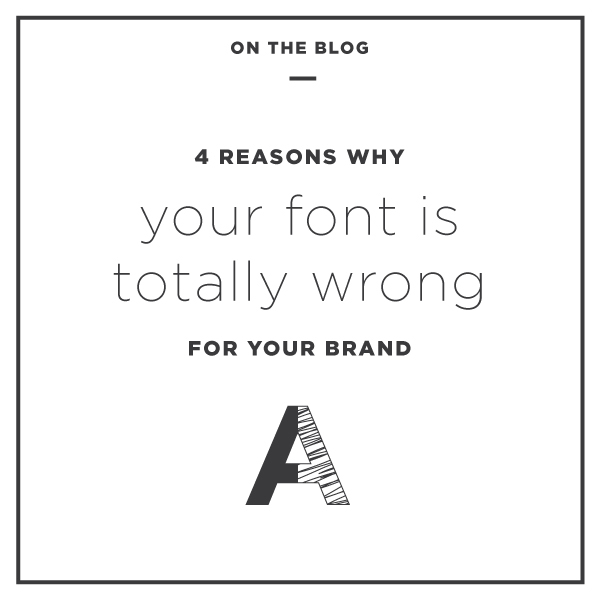 There you have it, 4 reasons your font is totally wrong for your brand. Did any of these raise a red flag for your brand? Ask a question in the comments below, I’d love answer and help you out!